The issue with gluten-free bread on the market today is that they still contain a lot of unwanted ingredients. Nutritionists and dietitians have encouraged whole grain breads instead of white bread. However, bread in general has a bad name as a processed food that contributes to weight gain and obesity. Bread found in the store is processed and contains empty calories. When eaten in high amounts, this can negatively impact blood sugar levels and digestion. Bread rapidly converts into sugar, and stores as fat in the body. When blood sugar levels are too high, insulin is released to help with the problem. Some glucose is stored in the liver and muscles, and the rest is stored in the fat storage center of the body called the adipose tissue. White bread will spike blood sugar even quicker than a candy bar! Wheat and whole grain bread also contains gluten proteins known as gliadin and glutenin. 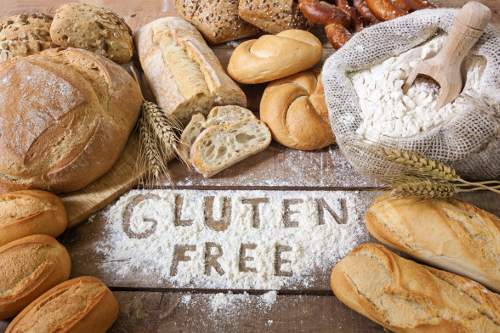 Gluten causes all sorts of health problems like digestive issues, muscle and joint pains, depression and anxiety, brain fog and memory problems, autism and learning disabilities, autoimmune diseases, hormone imbalances, neurological disorders like Alzheimer’s disease, and frequent headaches. Bread will also increase LDL (low-density lipoprotein) cholesterol. Once in a while, gluten-free bread provides a healthy solution, especially when you make it. The following are five gluten-free bread recipes that you are sure to enjoy. Most of the bread recipe on this list can be used to top your favorite healthy dip, like hummus or guacamole. Some of them can also be eaten like a snack or dessert, such as the banana bread recipe below. Not all bread is baked. Take for instance, this gluten-free recipe made with brown rice flour and buckwheat flour. Instead of the oven, you cook this gluten-free bread with a cast iron pan. You can use the bread as a wrap, pizza base, or for dipping into hummus. This gluten-free bread is high in protein and fiber, gives you energy, and helps with weight loss. This gluten-free bread recipe will make six pieces of bread. For the flax egg alternative, whisk the flaxseed and water together. Let it sit for five to 10 minutes until the texture becomes similar to an egg. For the bread, put the flours in a large bowl, and while stirring, slowly add the vinegar and water. When combined, add the flax egg alternative, and form the dough. Once well mixed, knead the dough for two minutes until it feels tougher, and form into a ball. Roll out the ball of dough with a rolling pin to make six six-inch circles. Heat a cast iron pan on medium heat on the stove, and once hot, place the flat bread in it. Cover the pan while it cooks. Cook for a minute or two on each side, until there is no more soft dough. When the bread is ready, transfer it to a plate and cover with a clean dish towel or cotton napkin to keep it soft. It is best to consume the bread on the day of preparation. If you want gluten-free bread that is simple and slightly sweet, the following recipe is definitely for you. The recipe will only take about an hour to make, but that includes prep, bake time, and cooling time. Although slightly sweet, this gluten-free almond bread can be used as a side for gluten-free spaghetti and tomato sauce. It is perfect for dipping! It is also great with avocado spread or almond or cashew butters. Preheat the oven to 325°F and grease a loaf pan. In a food processor, combine flaxseeds, flours, baking soda, and sea salt. Add the wet ingredients, and pulse five times just to blend. Pour the batter into the load pan—it should fill about halfway. Bake for 20 minutes, then cover with foil, and return to the oven. Bake for another 10 minutes, or until a toothpick inserted comes out clean. Cool the bread for about 20 minutes. Remove from the pan and cool for another 10 minutes. The following gluten-free bread recipe contains quinoa or buckwheat. If you do choose buckwheat, your bread will be slightly drier than other breads. Overall, this gluten-free bread recipe contains a lot of fiber with some psyllium husk, and healthy fat with chia seeds and flaxseed. It also contains anti-inflammatory herbs like ginger and turmeric. The gluten-free bread will make 12 slices, and keep in an airtight container for five days in the fridge. You can also slice and freeze it for three months. Grease a loaf pan with 1 teaspoon of coconut oil. In a large bowl, combine all dry ingredients and stir well. In a separate bowl, whisk together remaining coconut oil, water, and coconut nectar. Add this to the dry ingredients, and mix well. Transfer the dough to the loaf pan, and press firmly to prevent a crumbly loaf. Cover with a clean kitchen towel and let it sit on the counter for at least two hours or overnight. The bread is ready to bake when it retains its shape, but pulls away slightly from the edge of the pan. Preheat the oven to 350°F. Place the pan on the middle rack in the oven and bake for 20 minutes. Remove the bread from the pan, place it upside-down directly on the rack in the oven, and bake for another 25 minutes. The bread is done when it sounds hollow when you tap it. Want a vegan and gluten-free bread that avoids sugar? The following is another simple gluten-free recipe that won’t take long in the kitchen either. The loaf makes several tiny pieces that go perfect with ghee, jam, or nut butters. The bread will keep in the fridge for a week, or it can be put in the freezer for months. If you slice it before freezing, you can pull out a frozen slice whenever you want, and pop it in the toaster. Preheat the oven to 350°F and line a loaf pan with parchment paper, or grease it with coconut oil. In a large bowl, combine almond flour, chickpea flour, ground flaxseeds, baking powder, sea salt, and cinnamon. In a separate bowl, whisk together eggs, coconut oil, and almond milk. Stir wet ingredients into the dry ingredients until mixed, but do not over-mix. Place the thick batter into the loaf pan, and use a spatula to even out the batter in the pan. Bake for 20 to 22 minutes, or until an inserted toothpick comes out clean. Cool for 10 minutes before removing from the pan. Let it cool completely on a wire rack. Memories of grandma’s banana bread often create the desire for a similar recipe. This gluten-free bread belongs in the dessert category. It contains the delicious combination of bananas, chocolate, and cinnamon. The recipe is also full of flavor and free of the various common allergens like peanuts, dairy, and of course gluten. In a large bowl combine wet ingredients with a hand mixer until bananas are well combined and mixture is fluffy. Combine dry and wet ingredients, and stir well. Put in the extras like the coconut chips. Grease a load pan with coconut oil, and pour in the batter. In a small bowl combine the toppings and sprinkle them evenly on the loaf. Bake in the oven for 55 to 60 minutes, or until the center is set and a toothpick goes right through clean. Remove from the oven and let it cool for 10 minutes. Remove from the loaf pan and let cool for another 10 minutes. Serve with nut butter or grass-fed butter. Want better bread? Homemade gluten-free recipes will increase your blood sugar levels at a much slower rate. The gluten-free bread recipes provided in this article are also without additives, preservatives, and other questionable ingredients. However, it is important to note that these gluten-free breads likely shouldn’t be eaten in a sandwich. Use the bread to dip with a pasta sauce, or serve with nut butter, hummus, or your other favorite dips or toppings. Daniluk, J., “Hot Detox: A 21-Day Anti-Inflammatory Program to Heal Your Gut and Cleanse Your Body (Toronto: HarperCollins Publishers Ltd., 2016), 168. Prepon, L., The Stash Plan: Your 21-Day Guide to Shed Weight, Feel Great, and Take Charge of Your Health (New York: Touchstone, 2016), 186. McCarthy, J., Joyous Detox: Your Complete Plan and Cookbook to Be Vibrant Every Day (Toronto: Penguin Group, 2016), 127. Liddon, A., Oh She Glows Every Day: Quick and Simply Satisfying Plant-Based Recipes (Toronto: Penguin Canada Books Inc., 2016), 35. Werner-Gray, L., The Earth Diet: Your Complete Guide to Living Using Earth’s Natural Ingredients (Australia: Hay House Australia, 2014), 132, 150. Gunnars, K., “Is Bread Bad For Your Health?” Authority Nutrition; https://authoritynutrition.com/why-is-bread-bad-for-you/, last accessed March 9, 2017. Gladish, S., “Chocolate Chip & Cinnamon Banana Bread – Paleo Style,” Holistic Wellness, May 26, 2014; http://holisticwellness.ca/chocolate-chip-cinnamon-banana-bread-paleo-style/.